This page in a nutshell: When you blog, you participate in a community. Yes, it’s about you, but it also needs a context. Blogging is about participation. When you blog, you take an active role in just what’s important to you, your community, and the shape of the Internet at large. Blogs link us to these communities and allow discussion of important ideas to either grow or die. Because of the nature of digital content, there’s not a definitive way to blog, but you should consider the following. While many might debate just how one should blog (most online treatments just deal with the technical aspects), I suggest you begin by applying the basic skills you learn in your college composition courses and consider the blog as a public journal. I’ll add a couple of caveats. Much writing that you have done for composition in formal, educational settings likely involved your writing to a word minimum. In my experience, this has helped produce exactly the wrong type of writing for a digital age. Writing for digital media should take just the opposite approach: write for a maximum; i.e., set a 400-word maximum for an entry and make yourself stick to it. Writing for a minimum focuses needlessly on quantity, while writing for the Web should consider quality. As with everything else you write, every word and punctuation mark matters when writing for the screen. This attention to detail is the first sign of quality. When I say “journal,” I don’t mean a diary. A journal for college should always consider the context — usually what class you’re writing it for. This will dictate your subject matter and style. Despite the many approaches to blogging, they mostly all share a subjective approach. That is, they make no attempt to be objective like your local newspaper, but almost always take a personal view of the topic. On blogs, it’s the author’s opinions that seem to matter more than a neutral, objective view of the topic. That means you should not try to be a reporter. Users don’t read blogs for news, necessarily, but for a more nuanced and personal insight written by credible expert amateurs into the topics that most interest them. Always know your subject, purpose, and audience before getting into an entry. Consider blogging to be participating in a conversation. Unlike a journal, you are not writing in a vacuum, so be sure that you have something relatively original to say; this means that you should do a bit of research first to familiarize yourself with the current attitudes about your chosen topic. A strong entry will quote from and link to any relevant sources you find about the topic. Remember, this is a conversation: it’s not all just about you. Therefore, posts on Web sites should be inter- or hypertextual. This is part of what we mean by usability. Generally, most blogging platforms today allow two types of content: posts and pages. Consider the latter items that are fairly permanent about the blog, like an About page that gives a description of the blog and orients your users, and a Contact page that allows users to get in touch with the author. Other permanent pages might include a site map, an archive, an image gallery, or an index. Give the entry an original title and headline (sometimes called a subtitle — text that further details the title). These should not only inform about your post’s general topic, but give some idea about your position on the topic. Use an inverted pyramid strategy: put the most important information at the top of the entry and the less important near the bottom. Make your content scannable: use headers, sub-headers, bold text, short paragraphs, and a tagline. Make the post readable. Preview your entries before submitting them; this practice gives you the opportunity to make your entry as readable as possible. WordPress supplies a lovely “Preview” button in the “Publish” box. Take advantage of it. Or use a service like Medium that uses a WYSIWYG interface. Be sure your fonts are legible for the screen. Use categories and keywords, or “tags.” Keywords further classify your entry, like hashtags on Twitter. Select words that are applicable to your entry. Some platforms might not use this organization technique. Save often as a draft when you are composing, especially if you are not on your own computer. Most blogging platforms will periodically do this for you. You may compose on a word processor, but this will often insert unseen code in your entry, messing up its formatting. I would advise against this approach. Follow a consistent citation style (one appropriate for the screen — not for paper) and use standard conventions when writing in the liberal arts. Proofread and revise your entry before publishing it. 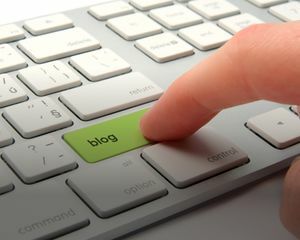 Remember, anyone can access the blog, so you want to publish only polished writing, as it reflects on your credibility. Also, a sloppy blog is sure to get ignored by the community. Allow users to reply or respond to your posts. In addition, it’s important that you also have a voice on other blogs. Have a clear focus, or argument. If you don’t know what your point is, then your readers certainly will not. Next, choose a focus for your blog. ↑ Goins, Jeff (2016). "5 Easy Tricks to Help You Write Catchy Headlines". Goins, Writer. Retrieved 2019-01-01. ↑ "The Inverted Pyramid". Daily Writing Tips. June 2, 2007. Retrieved 2019-01-01. ↑ Rowse, Darren (February 20, 2006). "Scannable Content". ProBlogger. Retrieved 2019-01-01. ↑ Butterick, Matthew (2010). "Summary of Key Rules". Butterick's Practical Typography. Retrieved 2019-01-01.